This is another one of the gowns I scored at that incredible estate sale for $10. I still need to take it in, I have clips in the back right now. I think I might take it to a tailor. I can't make up my mind. Half the time I can take something in perfectly fine. 50/50 might not be good enough for something this cool. As a side note my girlfriend bought me a perfect little silver vintage clutch to complete this outfit which I didn't have when I took these photos. Thanks Hazel! How did you know? A close-up shot of the fabulous beading and my vintage earrings. Don't worry…I'm not any getting closer than that. Otherwise it'll be like those microscopic mirrors they use for facials where your skin looks like the surface of the moon. With all of the great dresses I scored at that estate sale I seriously need to up my social schedule. My closet has a much more interesting life than I do. …"Build it and they will come." In my mind I live in Beverly Hills, living the high society life of a spoiled celebrity. In reality I live in what currently looks like the North Pole, living the simple life with a spoiled pug. My closet is mocking me. Does your closet mock you? Or are you great friends that get along swimmingly? OMG…THUD!!!! that dress is fabulous!! The beading detail is stunning and the color is gorgeous on you!!! Is it possible to shorten it so you would get more wear out of it! So beautiful…the color, fit, style…ti is stunning! HOLY CRAP! That is stunning. Stunning! I too live in Beverly Hills in my mind. This is so fabulous I cannot even see straight. You SO scored big at that estate sale! Well played! What a great dress – this color is striking on you!! I’ve have never paired purple with turquoise but it is stunning together. 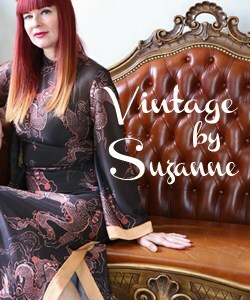 You have such great eye for vintage! You look stunning Suzanne:-)!!! Perfect color for you!!! Wow, you’re a knock-out! You do need to have place to take these clothes out to. Or just wear them anyway – grocery store, movies, coffee shop. Ya! why don’t wear them everywhere, who cares anyway? I’m with Val! You make me laugh with your close up comment Suzanne, you look great I say! If I had items as beautiful as that and the rest of your incredible estate finds, I wouldn’t mind at all if my closet were mocking me. I think I would just start planning some fun get together’s/parties with friends just for an excuse to parade around in those beauties, They definitely need to be shown off. So glad you showed off that bead work, wow-seriously $10? But, this is my silly way of thinking, score an incredible find for $10 and then turn around and throw a party for what $100-$200. Yep, that’s what I would do, go figure, haha. You look fierce in the stunning blue dress which makes your eyes stand out! Gorgeous color, just the right amount of detail and I am green with closet envy by now! The last estate sale I went (was of Sophia Loren’s summer home apparently) I took home a tea set! What happened to all the clothes, God only knows.. What a fabulous score Suzanne! Stunning dress, beautiful colour on you. Haha…I was just thinking, “Where does she wear all of these fab dresses? Her life is amazing!” And now you tell me your closet is mocking you! In any case that dress is freakin’ gorgeous…the color is beautiful on you. This vibrant, sparklingly gorgeous shade of vivid blue is at the very top of its game partnered with your gorgeous red locks and fair hued skin. You look nothing short of dazzling here! 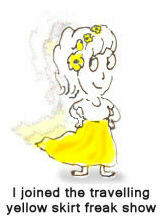 i am the same way…i have clothes for all occasions, and now just need the occasions! you look stunning!! Oh my goodness! What an elegant dress with a nod to old Hollywood style. I want to go to those parties with you! My closet no longer mocks me but it used to with it’s pencil skirts and high heels. It’s rather boring now. My goodness, you have a wardrobe I truly envy, Suzanne (and I don’t say that very often!) That is yet another stunner of a dress, so yes, get the alterations done and wear it wear it wear it! What a find and this color is so very good on you! Maybe shorten the length and wear it in the summer. Wear it often because this dress is outstanding with your hair and coloring, a real show stopper! I was thinking about how well that beautiful gown fit you, so your clips in back must be doing their job! The beadwork is exquisite…and the earrings are utterly perfect!!! As for the closet mocking…mine does that too. Not in a Hollywood-kinda-way, but more in a I-dare-you-to-wear-everything way. I do plan to prove it wrong one day! “If you build it, they will come.” Perfect! I’m living the same delusional wardrobe life as you are. 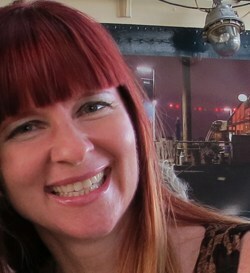 It always makes me laugh if we go out and the restaurant hostess says something like, “You look so pretty! What are your plans tonight?” This. My plans are to come here and have a pint and a burger. That is why I’m dressed up. I’m so glad you shared another of your dresses from the estate sale. Fabulous finds! The color of this one is just amazing, and the beading on the cap sleeves is such a gorgeous touch. One of my philosophies about super dressy attire and no where to wear them is to plan a special date night at home. Bust out the fancy wine, set a gorgeous table, light the candles, and fix a fancy-schmancy meal. You still get to dress to the nines. No one sees that you’re insane. Win-win! The beading on that dress is amazing! It’s truly a piece of art! And the color is so vibrant. I think all of us are guilty of purchases that don’t quite fit into our lifestyle. What if you hemmed the dress to a knee length? I know it’s a shame cutting such exquisite piece (it’s kind of like painting an old piano)but it might make it appropriate for more occasions. What an amazing dress, Suzanne! Such a score! Wow. WOW! What a beauty you are. The dress just points it out brilliantly. Hire the tailor. It’s a killer, this dress. Have an Academy Awards party … dress code: formal. Then change three times in the course of the evening. One of my favorite things (okay, my only favorite thing) about having our little restaurant is that I can shamelessly overdress and can actually wear some of the fancier items in my closet. Nothing to this level of elegance, though! Wonderful dress and great pop of purple shoes. What a fantastic dress!!! You look so elegant. 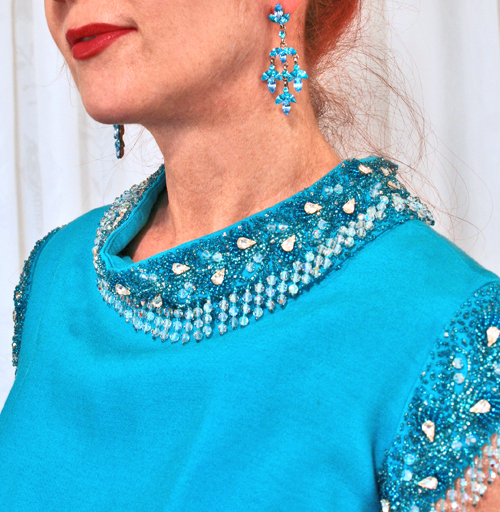 Love the blue and the fabulous beading, they look gorgeous on you. Thank you so much for linking with Très Chic Style Bits. That dress is such a gorgeous colour (one of my personal favourites), and once it’s taken in, you will be an absolute Bombshell walking into a room wearing that. The dress is it’s own party, but I’m sure that an occasion to wear it will present itself; you can’t own a dress that dreamy without taking it out somewhere. As another commentor noted, it would be perfect for an Academy Awards Party. I hear you lady, I hear you – my closet mocks me too. Any time you want to paint the town red in London (or blue as the case may be) just let me know! 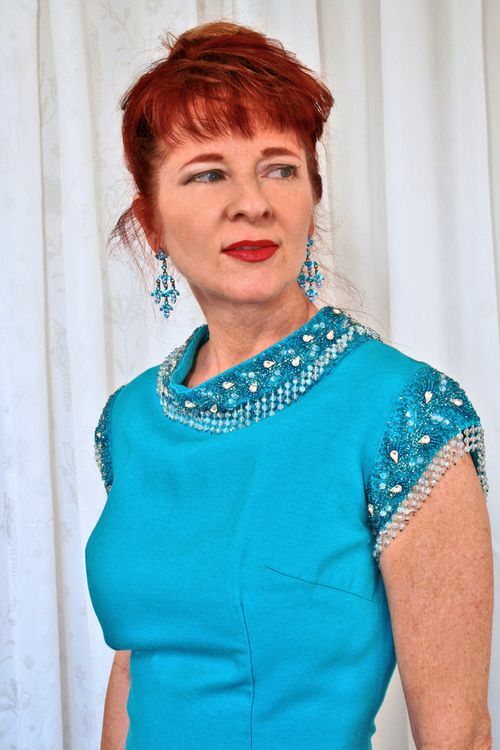 This is an awesome dress, such a great colour – get thee to a tailor now, it needs an outing asap! The beading is wonderful! Actually I like Jan’s Academy Award party idea – you know if the opportunities don’t present themselves you may as well make them. Such elegance!! Glorious colour and the embellished beading is exquisite! The earrings are perfect for this dress! Now you’re ready for all those fancy dinner parties and evenings at the Opera! I’m not sure if shortening the dress would be better for me or not. I can’t make up my mind about that. I’m going to leave it long for now and see if I can’t wear it out for drinks or some kind of get together once the weather warms up here. Who knew you could find these kind of pieces at estate sales? Those people out in Beverly Hills don’t know how good they have it! I’m working on that. Now if our weather would cooperate I wouldn’t need 7 layers each time I leave the house. It detracts from the whole idea. LOL…no doubt! With over 200 skirts I’m surprised you have room in your house to go to sleep! ha ha. I’m waiting for the weather to get better and then will plan on walking my dog in this. LOL Of course she will be wearing a matching blue bejewelled collar. : ) thanks Ariane…I know you’d have the balls to wear this anywhere. My girlfriend and I were just talking about that the other day. We are thinking of planning a girlfriend tea party for the summer. I will need to go back and reference all of your great party tricks. I’m working on it. If only New Year’s were more than once a year! I cannot believe you went into Sophia Loren’s summer home! What a treat! How cool you got a tea set. I’m sure they auctioned off those clothes. Too bad. They would have been amazing. I’m sure it was fabulous just to see the house. Lots of clothes in my closet that I am bored with but are still really good. So I tell myself off for being so spoiled. I wish I could combine better, but I am hopeless at that. And I am sure a venue will come this summer to wear this lovely dress too. A garden party? Or will your heels sink into the grass? I’m still unsure about shortening this dress. I can’t decide if it would make it more wearable or not. I might try pinning it and taking photos again to see if I like it shorter or not. I LOVE the idea of changing three times in the course of the evening! Sadly we got rid of our cable TV almost 2 years ago now so I need someone else to host the party. That is cool about being able to flaunt your great wardrobe at work. The delicate beading on that dress is out of this world <3 The color is so radiant, too. Gorgeous! Your closet is acting like dogs behind fences when you walk past with your dog on a walk – it’s jealous of your freedom. Let it mock. It can’t have cocktails and schmooze in aqua like you can, it can’t say, dang it, I am wearing this to bruch with a denim jacket and hi-tops to tone it down a little from its stellar heights. Don’t fall prey to its emotional blackmail. But still be nice to it because otherwise it may make friends with silverfish.